The Summer Capital of Southern Philippines- the Municipality of Lake Sebu, frequented by both local and foreign tourists due to its panoramic view, the presence of the Indigenous Cultural Communities as dominated by the T’boli people, and offers various tourism activities that includes cultural and adventure tour, trekking, bird watching, and a lot more invites everyone to celebrate with them the 15th Helobung Festival on November 7-11, 2011. The Helobung Festival celebrates the T’boli culture by showcasing their traditional songs, dances and crafts. 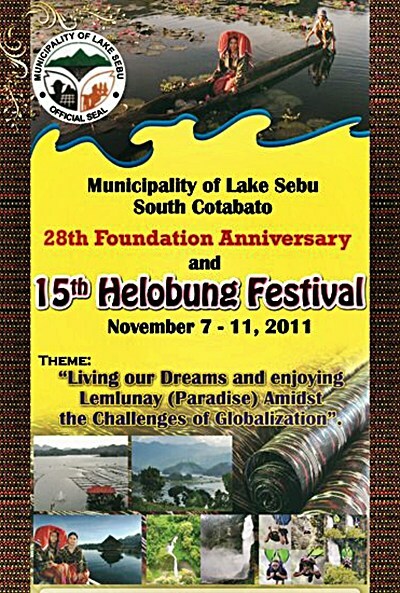 Below is the list of activities for the 15th Helobung Festival.